You should delete NanoSurfer as soon as possible if it happens that you detect it on your system. If you do not do that, this software might cause harm to your computer. NanoSurfer is not very harmful itself; however, it has been found out that it generates commercial advertisements that might lead you to malicious software. The program will not do anything beneficial, so we do not think that it is worth keeping it. If we have already convinced you to erase NanoSurfer, you should know that this software can be deleted via Control Panel. If it happens that you still do not know how to remove NanoSurfer, you should definitely use our manual removal instructions or scan your system with a trustworthy automatic malware remover. Make sure that you read this article prior the removal of this adware. You might wonder why you need to remove NanoSurfer, but the answer is really simple – this program might cause you security-related issues. The application itself is not harmful; however, there is a huge possibility that unreliable links will be embedded into ads displayed by this program, because nobody checks them. As you can see, it is rather risky to keep NanoSurfer installed on the system, so we suggest deleting it as quickly as possible. No, the program itself will not take care of your security because it has not been published for your benefit. 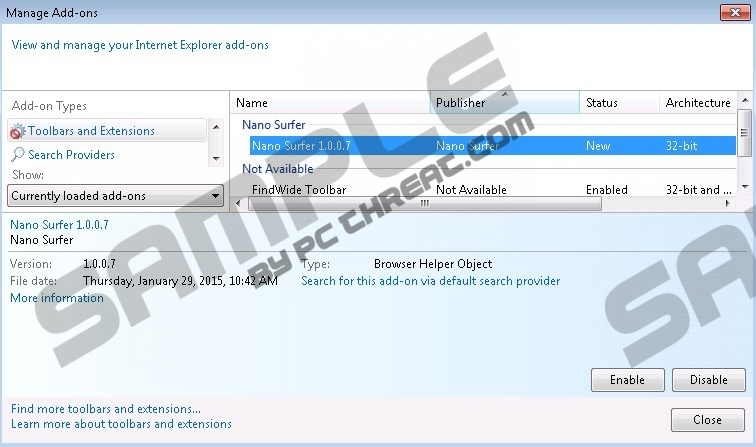 You can remove NanoSurfer via Control Panel. Our manual removal instructions, which you will find below the article, will help you to do that. Do not forget that you should scan your system with an automatic malware remover as well in order to remove other unreliable applications from your PC. It is very likely that they are present if you surf the Internet on a daily basis. SpyHunter will help you to do get rid of them once and for all. Right-click on the bottom-left corner of your screen. Right-click on NanoSurfer and then Uninstall it. Quick & tested solution for NanoSurfer removal.